Just about anything can happen week-to-week in the NFL, and as this young season continues to evolve we continue to see standout performances from both fresh and familiar faces around the league. Sunday brought another action-packed slate of games, highlighted by the NFL’s largest upset in 23 years, led by a hungry Buffalo defense carrying a rookie QB who was making his first road start. Without further ado, let’s focus on some top defensive performances from Sunday. The Bears again relied upon PFF’s top-ranked defensive unit in their win over Arizona. Safety Eddie Jackson provided strong coverage on the backend all day and picked off a deep pass early in the third quarter which led to the Bears first touchdown of the afternoon. Jackson also notched two defensive stops on the day and only allowed one reception for three yards into his coverage. After playing safety, slot and boundary cornerback intermittently throughout his career, Byron Jones’ permanent move back to the boundary cornerback position has produced impressive results so far. Against Seattle, Jones allowed three receptions on seven targets for a mere 10 yards, he also added two pass breakups and only allowed a passer rating of 50.3 into his coverage. PFF’s fourth-ranked overall player in 2017 has expectedly continued his brilliance when on the field in 2018. After missing Week 2, Wagner showed well against both the run and pass against Dallas, with five defensive stops and a pass breakup that eventually ricocheted into Earl Thomas’ arms to seal the game late. Despite the loss, Green Bay’s 2016 first-rounder was a force in Week 3 against the Redskins. He stuffed the stat sheet with one quarterback hurry, one batted pass, and seven defensive stops. His 24.1 percent run stop percentage was part of an imposing performance that is also reflected in the dreadful grades put up by the interior of Washington’s offensive line. While Aaron Donald’s impact is not evidenced in the traditional box score, ask Chargers quarterback Philip Rivers if Donald impacted the game. He lived in the Chargers backfield throughout the day and finished with five hurries and one hit rushing the passer along with one stop in the run game. Vikings signal-caller Kirk Cousins was under duress all afternoon, with Buffalo’s two edge defenders, Hughes, and Lorenzo Alexander, leading the league in hurries with nine and eight, respectively. 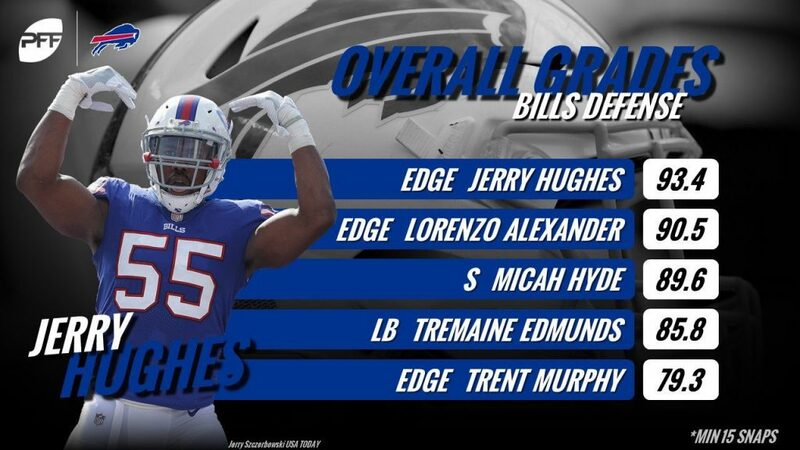 In addition to his nine hurries, Hughes brought home two hits and a sack and ultimately helped lead Buffalo to victory. A three-play stretch highlighted a vintage J.J. Watt performance, as he stopped Saquon Barkley for a five-yard loss on the first play and had a strip-sack of Eli Manning on the third. He finished the day with three sacks, two hits, and two more hurries as a pass-rusher. Mills was very active throughout the day, finishing with three pass breakups on the six throws in his coverage. His two pass interference penalties against T.Y. Hilton brought his grade down a bit, but ultimately, he only allowed eight yards in his coverage on the day. Across 42 snaps in coverage, that pegs him at an impressive 0.19 yards per coverage snap. Along with PFF stalwarts Watt, Donald and Wagner, Justin Houston is another player who would have earned a mention in this space many times throughout a well-regarded career. Despite dropping into coverage more than usual, Houston finished the day with the league’s top pass-rushing productivity (20.0), with two sacks and four hurries on 25 pass rush snaps.